1. I am playing Scrabble online again, after an extended hiatus. Surprisingly, I do not seem to have had that dramatic of a skill regression, although I am a little out of practice. 2. I have fallen completely off the diet wagon. As you may have noticed, I didn't post a weekly weigh-in for this week. I should have, but I forgot in all the excitement about Thanksgiving and audioblogging. Don't worry, I will continue to provide Thursday weight accounts in the future, even if it all it serves to be is a reminder of defeat. 3. I did use the treadmill today, really, truly. 4. The Saints are ahead of the Offensive-Name-for-Native-Americans 24-20 in the fourth quarter. If they hang on to win, I think Rob and Dahlia may be sharing this week's prize for Rob's NFL pool. ESPN.com has joined forces with the effort to reduce web usage at work by introducing a new service called ESPN Motion, which promises to bring video clips to your screen but actually completely crashes your computer whenever to call up ESPN.com in your browser. Or at least this is what it does on my machine, and not just a regular need-to-reboot crash but the kind where you have to physically turn the computer off and on. My father had surgery earlier this week. Although everything appears fine, I have been thinking about him much the past few days. Probably I should have gone home for the holidays, I know, I know. My father has watched Wheel of Fortune every night for as long as I can remember. The station carrying it is the CBS affiliate (Channel 8) in Des Moines. Back when I was in college, they would run this contest where they would flash some icon on the screen at the start of a puzzle, and then the eighth person who called in with the answer to the puzzle would win a prize and, probably more importantly from my father’s point of view, have their name and hometown flashed on the screen. He used to be excited when I would come home from college because I can usually get the puzzle pretty quickly. I would tell him the answer, and he would run to the phone. We had a rotary phone then. (Or, at least, my father was nearly deaf from his thirty years meatpacking, and the rotary phone was rigged so that he could hear with it.) My father would sit there and determinedly crank out all ten digits of this telephone station’s phone number. If the line was busy, he would do it again, until the name of the winner and hometown appeared on the screen. I don’t know if you have any idea how slow dialing a rotary phone is, but also back then it took some time to connect a long distance call. My sister, who had a deeply merciless streak within her, took some delight in noting that there was someone in Des Moines who had the digits for the local call on his speed-dial making thirty calls in the time it took my father to make one. The hometowns of the winners were almost always either Des Moines or some town very close to it; I never saw a winner from over a hundred miles away like we were. My father had basically no chance of winning but carried on every night as if he was oblivious to that. This annoyed my sister to no end, like it was some kind of affront to the familial intellect. I sometimes I allowed myself to feel annoyed too, although I don’t know why. What was my father supposed to do? We had the rotary phone because it was what we could afford that would accommodate his hearing. Nobody would have regarded it as sensible for us to pay a bunch of money we did not have for a touchtone telephone for the hearing impaired just so we could have a better chance of winning this contest someday. We did not have the resources to pick up and move closer to Des Moines, I think most people would think it was foolish to pick up and move just so one could have a better chance of winning a little television station contest some night. What my sister and I had concluded was that it was the smart thing to resign that one wasn’t ever going to win the prize. As I get older, it becomes harder for me to see wisdom in someone deciding that losing is inevitable and that labors to the contrary are pointless. Especially when you don’t have any alternatives that will increase your odds of winning and especially when, ultimately, you just really enjoy Wheel of Fortune. Even though he never won, I am positive that my father enjoyed rushing to the telephone every night more than he would have enjoyed staying put in his chair and grumbling about how the contest was really just for people in Des Moines. "Today in America, you have a better chance of being called back for a job interview if you're white with a criminal record than you do if you're black with a clean record—never having been arrested or convicted. Institutional racism exists in this country not because institutions are run by bigots or racists, but because of our unconscious bias towards hiring people just like ourselves. " Update: The American Sociological Association website has its own blurb about this, which I would link to if I hadn't already closed the window and the site weren't so abysmally slow this morning, with the following quote: "Pager's findings have now taken off like "wide fire" in the national political arena. And, a mere five days later, during the Sept. 9 debate among the democratic presidential hopefuls, the debate moderator posed a question about the Northwestern University sociologist's research." Um, "wide fire"? jeremy gets caught up in the thrall of innovation pretty easily, doesn't he? Hmm, given all the other occasions when newspapers do not name sources, perhaps this would have been a good occasion as well. From an NYT column: "Here at the grass roots, the Catholic Church is a vibrant, flexible organization enormously different from the out-of-touch Vatican. At the Catholic-run hospital here in Sonsonate, doctors tell women about IUD's and the pill — and especially about using condoms to protect against AIDS. Their humanitarian work is a reminder that the Catholic Church is much greater than the Vatican: local priests and nuns often ignore the troglodytes in Rome and quietly do what they can to save parishioners from AIDS. "'The bishop is in San Salvador and never comes here,' explains Dr. Martha Alica De Regalada. 'So we never get in trouble.' "
I'm looking at the manual for the WAIS-III (the Weschler Adult Intelligence Scale, version 3). One of the words in the vocabulary test is "evolve." If you read any texts on biological evolution, they might color how you think about the term, and what is stressed again and again is that evolution does not imply progress or some positive direction or growth. For that matter, if you look in a dictionary or just listen to people use the term, you can tell that people use the term all the time to refer to transformations that are not necessarily positive ("devolve," in contrast, always implies a transformation that is negative). The only way you can get the maximum 2 points on the "evolve" question on the WAIS, however, is to give some answer that implies progress. For example, if you say "to change over time," you only get 1 point, but if you say "to change and progress over time," you get 2 points. A friend of mine wanted me to post a section from a press release about a presentation they had done, although because the friend also didn't want any potentially identifying information I can actually only quote one sentence from it. In getting the reaction from an audience member to the presentation, the release says: "'I was sick to my stomach,' [the audience member] said after the presentation." Congratulations to my friend for producing social science findings so compelling as to induce intestinal discomfort! employment tugs at your loyalties in any way? When I was in graduate school, I declared that I would transfer 50% of my college sports loyalty to whatever college or university was pleasantly wrongheaded enough to give me a job. I never imagined that I would be hired by another school in the Big Ten conference. My first semester here, I was invited to attend the Wisconsin-Iowa basketball game here by Jerry Marwell. I decided that I would be neutral through the game and even showed up wearing some amalgam of Hawkeye and Badger regalia. However, as soon as the game began, it was plain in my heart that I wanted the Hawkeyes to win. So, since then, my line is that I root for both the Hawkeyes and Badgers on all occasions except when they play each other, and then I root singlemindedly for the Hawkeyes. My father and I were going to go to the game here in Madison, but then my Cousin Steve decided to get married the same day. So I ended up watching part of the Iowa-Wisconsin game on my parent's TV, and listening to the end of the game on some lonely stretch of Iowa highway as I was driving back to Madison. Two years ago, my father and I sat in the stands and watched the Badgers defeat the Hawkeyes. He had just had the surgery for his cochlear implants and was stone deaf, so I had to buy a legal pad to communicate with him. I remember writing vile things impugning the skills and character of then-reserve quarterback Brad Banks, who the next year led the Hawkeyes to ten wins and finished as the runner-up in the Heisman. Which provides further evidence that Football Coaches Know More About Football Than I Do. The Hawkeyes finish the season 9-3, which is quite remarkable considering how many injuries they had, and word is we might be playing in the Outback Steakhouse Bowl in Florida. No word yet on whether any of my college friends are making travel plans for the game. A different possibility is that we will end up playing in the Sun Bowl in El Paso, TX. The Hawkeyes have already been to the Sun Bowl twice in the last decade, and you would be surprised at how many Hawkeye fans believe that you really don't need to make more than one trip to El Paso to pretty much see the all there is to see. I didn't get a chance to write a weblog entry from home this weekend. I ended up only being in the hometown area for only a little more than a couple of hours, because I was worried that there was going to be a blizzard and I was going to be stranded there. So I ended up driving over ten hours total on Saturday so that I could attend my Cousin Steve's wedding. I did get a chance to look at my mother's computer while I was home and confirmed my suspicion that her excruciatingly slow Internet connection seems to be the result of a slow dial-up link (and maybe a slow PC). Rural America is increasingly left behind as the web presumes faster hookups. I think my mother is only connecting at 28.8k. For double the cost and a $75 installation fee, I could bump her up to their wireless service which is only 256k. My mother has got the idea from my sister Faye that one thing she might be able to do to speed up her service is give a call to the technical support people at MSN.com. Faye actually did get some problem she was having with her account solved by calling MSN.com. Of course, that she was able to do this probably has something to do with the fact that she lives in Atlanta and actually gets her e-mail service from MSN.com. My mother's Internet service, on the other hand, comes from a company based in Iowa that I send money to on my mother's behalf every month--it's the only service provider available there because big companies like MSN and AOL don't service rural areas. Given that my mother doesn't and cannot get her Internet service from MSN.com, I don't think they would be as helpful for my mom as they were for Faye. The confusion comes in because my mother and sister both use Hotmail, which is, after all, a MSN product. I don't know if my sister Faye has latched onto this and keeps telling my mom that MSN can help her with her connection problem, or if she just told my mom once and my mom skeeps repeating it to me. Anyway, I can't seem to explain to my Mom that even though they both use Hotmail for their e-mail, Faye gets her Internet service from the same company that makes Hotmail and my mother does not, and that what really matters for your connection is the company you use to get your Internet service. I mean, if you understand that last sentence, you understand exactly what I seem unable to convey to my Mom. Let me know if you have any ideas for analogies or whatever that would help my Mom understand why calling the company that makes Hotmail could yield results for my sister Faye but not for me. An article in Slate by the usually sage Jack Shafer offers some self-styled evolutionary psychological explanations for the appeal of tabloids. One quote: "This gossip is so finite and restricted that only the primal power of evolutionary psychology can explain their pervasive hold on the collective imagination. " when dahlia is all i see. becomes a dahlia to me. dahlia i think i'm in love with you. I think he is trying to sweet-talk her because she is lurking close behind him in his NFL pool, in a fierce battle for third place. 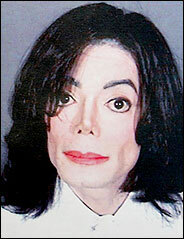 Obviously, there are all kinds of cheap and easy jokes one could make about Michael Jackson. Still, it's worth taking a moment to ponder that this is actually the unPhotoshopped face of a human being. That's a real human nose, there. If you have indefinite sums of money, you can harness wonders of modern science so that this is what you see when you look in the mirror. For those studying for the Jeremy Freese category on Jeopardy!, my favorite Michael Jackson song is "The Way You Make Me Feel." Because I grew up in the middle of nowhere with only one Top 40 pop radio station (everything else was country), I know all kinds of Casey Kasem-ish trivia. I know that Thriller started and ended 1983 as the number #1 album, the first (and presumably still only) album to do so. I know that it's run at number #1 in 1983 was interrupted a couple of times, including four (?) weeks by The Police's Synchronicity. I believe, although this I'm more hazy about, that the album that Thriller displaced as the number #1 album in late 1982 was Business As Usual by Men At Work. My guess about the order of singles released off Thriller was "The Girl Is Mine," "Billie Jean," "Beat It," "Thriller," "Wanna Be Starting Something," "Human Nature," and "PYT." Wait, switch WBSS and "Thriller" around. God, what is it about early-adolescent boys and lists? Of course, one way to keep track of your changes in one's psychological or other states is to be keeping some kind of ongoing record for later review. I know people who keep "mood diaries" from day to day so they can track exactly how deeply into the pit of despair they've gone compared to earlier, happier times. Alternatively, there are websites like this one that one can use to send e-mails to themselves in the future, reminding them exactly how things used to be and all the things they resolved to do by the time the e-mail was delivered. A graduate student was complaining to me the other day about how The Faculty In This Department never have ideas for projects that graduate students can do. Especially an idea that wasn't related to whatever, in her words, "stupid" projects they themselves happened to be working on at the time. So, as a bravura performance, I right there spun a research question that I'm not going to pursue but would think it would be intriguing if someone did. Oh, and the other requirements are that it had to be something that would be primarily an in-depth interview project and related to some other topic we had been talking about in the previous five minutes. One such eligible topic was psychiatric medications. So here was my research question, now being made available to the weblog reader world for free. The set-up: All kinds of people take antidepressants. Many of those people come to believe that the medication is doing them some kind of good. Practitioners, who see all kinds of patients, also believe that medications do many of their patients good, although some other patients do not appear responsive to medications. Now, if you look at the studies that are used to demonstrate the efficacy of the various popular antidepressants, you will notice that the positive effect of the medication is basically value-added on top of a "placebo" effect. Another way of saying this is that, depending on what meta-analytic conclusion you believe, either some, much, most, or almost all of the positive effect that beginning a regimen of antidepressant medication will have for a group with depression is actually a positive effect that they would have if they had never taken the drug to begin with. Meaning that there are some people out there who will attribute their improvement in mood to a drug that actually didn't really affect their mood. For that matter, you regularly hear people make claims about how they were helped by taking an antidepressant much more immediately than the time required for the drug to work its alleged neurochemical wonders. In other words, you have people claiming improvement after four days of taking a drug that isn't supposed to have appreciable physical effects for four days. The question: How is it that people make inferences about whether or not an antidepressant medication is working? In a clinical trial, the efficiacy of the drug is demonstrated through statistics--you never know for an individual case if the drug helped them or if they would have just started feeling better anyway. But we don't get to live clinical trials, we have to make inferences about our own personal case study all the time. Moreover, it's not like one gets to live one's life holding everything constant except for the drug--instead, starting a medication regimen happens in the context of the welter of all the other events in one's biography. Plus, one is usually told that the medication won't work for awhile, which means you are comparing psychological states not extremely proximate in time. How do people come to infer that their moods are better or worse than they had been at some point in the past? And, if they are better, how is it that people come to attribute that improvement to the drug? Is it that the concept of regression to the mean is so unnatural to the mind that if people perceive themselves as getting better and they have started to take a drug, they will always credit the drug with their improvement? Do people ever think, sure I started taking Prozac, but I think what it really was was [some positive biographical event happening]? Or, better, sure I started taking Prozac and started feeling better, but given that I started taking Prozac at a low point in my life, the reasonable guess would be that things would get better. If people do use different logics for assessing whether or not a drug has done them any good, is there any logic to their choice of logics? I wonder to what extent this project has been studied in clinical psychology. Even if it has been studied, I bet there are things I wouldn't like about how it had been studied. Someone in academia could probably do this study without ever having to leave their building to find people to interview. Anyway, the ultimate point is that ideas are easy. It's everything that comes after the idea that's hard. Especially, in my case, sticking with the idea. world, listen to my medley of pain! As performed here by some of the most famous names in music. Hurry, who knows how long this link will work? Not to be morose, but I feel like cosmic revenge is being exacted upon me for my not being more understanding and sympathetic of people who had trouble making progress on theses and dissertations back when I was in graduate school. Or for not speaking up in protest when I heard another, more senior, sociologist say at some dinner that there were really only two specialties in sociology, CAN and CAN'T. But, progress is being made, even though I have not exactly been either a poster child for effective dieting or exercise lately. Today's weigh in was z - 7.8 pounds, or down 1.4 pounds from last week. In terms of tracking my progress as a hypothetical journey from Seattle, WA (starting weight) to Key West, FL (goal weight), this pushes me farther down the road but I am still somewhere in Montana. I have only now had the chance to review an extensive e-mail sent to me by the wunderkind "Rob" Babycakes Clark. Rob pursued the question that I posed in my earlier "Any Given Sunday" weblog post and its follow-ups, namely, what is the relationship between the variability in outcomes of professional football and baseball games, and is football just as variable in its outcomes as is baseball. So that there wouldn't be any real grounds behind the common quasi-statistical argument that people make for a baseball regular season containing ten times as many games as a football regular season (namely, that talent outs more successfully in football games). The result of Rob's painstaking analysis is, basically, no--baseball is still more unpredictable. For this, among other things, he compared the variance among the regular season records for the last five years with the MLB records after 16 games. The variance in NFL records in higher. distribution of wins/losses are across baseball teams after 16 games. look at the distribution of winning percentages in baseball through May. ...and I know, the world has many very painful things in it... is listening to recordings of refusals to participate in a telephone survey that you have helped design. Especially when the people doing the refusing are all around the same age as your mother and father. The UWSC interviews really do a valiant job of trying to convince people to participate, but, since you know the cases are refusals, you know that all their striving is for naught. Okay, so it's not really the absolute most painful thing in the world. It's not even the most painful thing I've done in the name of service to sociology. That would probably be making the index for the Stata book. It wasn't just that it was tedious, but it had to be done in this particular software package (Scientific Workplace) using a very particular set of steps that had to be done correctly each time or else the program wouldn't compile the file correctly at the end and there was the possibility of losing all of the index entries I had made. There wasn't anything to indicate whether you had made a mistake, either, so it was this strangely exquisitely painful combination of a highly tedious task with a highly attention-demanding one. I would have rather spent those twelve hours staring into the sun. I suppose I would compare listening to some of these refusals to sticking a Band-Aid on your eyeball and then tearing it off very slowly. Quote from Britney Spears: "The best part is the fans -- the fans, like, loving you. And the free clothes." I'm interested in maybe buying a copy of SAS for use in doing data analysis on my office PC. Given that I couldn't figure out the SAS website, I figure this bodes ill for my gaining any kind of proficiency with their software. The speedometer on my car has been broken. Today, for no reason, it started working on my drive into campus. At the same time, however, the fasten-belts beep started beeping and continued beeping every three seconds (I counted, using the Mississippi method) for the entire trip. Update: Multiple readers have e-mailed urging me to call Click and Clack about my car problems, with the hope of taping it and having something to share with the weblog. Unfortunately, I've never listed to either Click or Clack and hear that their show presumes a bit of fawning familiarity in order to get on the air. Additionally and unrelatedly, another reader has e-mailed wondering how I have managed to go so long without any weblog post titles that are puns on "Queer Eye for the Straight Guy." I'm working on it. in which collective action problems can be solved. For that matter, I'm so enthusiastic I'll even include a link to the official pdf for the article even if I have no idea if that pdf actually works or is screened out by some website security feature. I read the article straight through in my office, remaining so riveted while I read it that the motion detector in my office turned the lights off twice on me. I'm normally so restless in the office that I think I've only had the motion detector turn off here twice before ever. Also today, I was told by a graduate student whose presentation I had gone to earlier this semester that the student had judged the comments I had offered to be the "Least Relevant" of anything that anyone said about it. is this his real tongue? 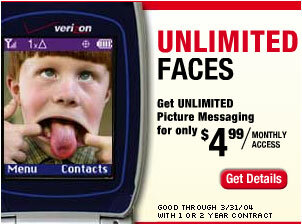 does it really make picture messaging seem desirable? more desirable than if they had used his real tongue? Doing some recreational data analysis. Above is a graph using data from the NLSY79. In 1984, a random sample of Americans aged 20-27 were asked "When in the menstrual cycle is pregnancy most likely to occur?" The answer categories given were "Right after the period," "During period," "Right before the period," "2 weeks after period begins," and "Anytime during the month." 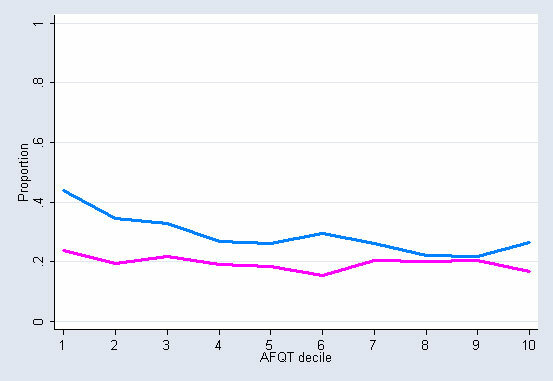 The pink and blue lines above represent the percentage correct answers for women and men, with the x-axis representing deciles of scores on the Armed Forces Qualifying Test. Um, if you don't know, the correct answer is "2 weeks after period begins." Update: Scintillating as the first graph may be, this second one is better. This is the percentage of people not giving the correct answer who answered "don't know," rather than guessing incorrectly at one of the alternatives provided. The results above indicate that for men, the smarter you are (as far as test scores go), the less likely you are to indicate that you don't know what you don't know. Okay, so I have purchased a pricey piece of exercise equipment. So now we will have a period of suspense while waiting for the answer to this question: Will I actually use it, or will it sit unused as an monument of my laziness? Readers are free to make bets amongst themselves. Here on the weblog, I will be keeping track of how many hours I have used the treadmill, so we can keep track of how much I paid for each treadmill-hour of actual use. The treadmill cost me about $600 with delivery (retail price: $800). If I use the treadmill more than 60 hours, meaning that the per-hour cost is under $10, I am going to consider that a victory (you may perhaps believe that I should be setting a higher standard, but you can keep that sentiment to yourself). Today I was on the treadmill for the first time and for 45 minutes, so that's my cumulative use to date. Meaning that, so far, my purchase as amounted to the same thing as renting the treadmill at a rate of $800/hour, but it will only become more of a bargain each time I step on it. 1. My parking space has been upgraded so that I am now 2/3 closer to campus than I was before. 2. My treadmill arrived today. The delivery guys came and set it up in the RV just about an hour ago. Update: Yes, I realize that these may appear to be off-setting announcements. Shelly B, the most efficient websearcher I have ever known, has taken pity on my nose-hemorrhaging-plight and responded by finding this truly creepy URL for How to Stop Nose Bleeds. If you check out this page, be sure (a) to notice the URL and (b) to at least scroll all the way through to marvel at its extensiveness. Reading over the last post, I find it troubling how much my casual writing style has come to depend on the long hyphenated phrase. I suppose I use this because I'm conscious of how lame it would be if I was using scarequotes any more than I already do. When I put down my thoughts on something, I'm surprised at the extent to which those thoughts turn on long strings of words that I feel I have to evince some personal distance from and some increased sense of these-words-go-together than what I get just by putting the words all in a row. With the methods requirement, the idea has been floating around for as long as I have been here that there should be some kind of qualitative methods course (now, as it was brought up in the meeting, a whole sequence) that students can take instead of some existing requirements. I think people are expecting me to be resistant to the idea because it might possibly spell the end of Sociology 750 ("Research Design and Methods"), which I teach. I don't know if that's really so much concern to me. I could reconstitute an all-quantitative version of the class that was all about, say, "Secondary Data Analysis", and it would probably ultimately be less work and more straightforward than 750 as it now stands. Besides, to be honest, I'm not thinking that far ahead about my teaching plans anyway. I think that when people talk about a qualitative methods sequence, there are really two issues that get run together. The first is more-qualitative-methods-courses for students who want to do qualitative research. (It would be nice to have more qual methods courses, although, just like students interested in quantitative methods and statistics courses, it's easy for students to radically overestimate how much their research skills can be augmented through coursework.) The second is less-quantitative-methods-courses for students who want to do qualitative research--that is, why should students who have never had any plans to do quantitative research be required to sit through so many quantitative classes. The first issue is all that people talked about at the meeting, while the second issue is what I would expect would provoke the larger source of tension. My own opinion is pretty congenial to the idea that qualitatively-oriented-students should not be required to do some much quantitatively-oriented-coursework. My own desire, which I have only implemented with modest success so far, is to move 750 away from seemingly like another quantitative course. 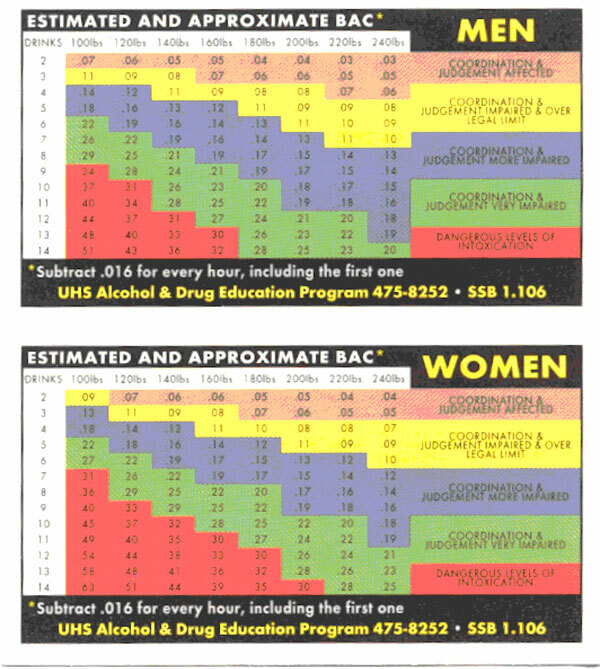 Obviously, a more radical approach would be to eliminate 750 entirely. Which is what may happen, although I'm maybe a little surprised that people don't look at statistics sequence more as a place where maybe we might think about making one less course required for students. I'm not very fond of the way that many sociologists think about the relationship between statistics and research anyway. Because so much of quantitative sociology is based upon the analysis of secondary data--meaning, data whose collection the sociologist had no role in--concerns about statistics have a way of crowding out thinking about design. Statistics is really just a technical apparatus for quantitatively characterizing all sorts of different aspects of some collection of representations, which brackets out the question of how you get a collection of representations that are reasonably good representations in the first instance. An entirely different issue with the idea of forming separate sets of requirements by which students can identify and track themselves as "qualitative" or "quantitative" is what this will do to the department's sense of being one department. Or, maybe better put, its sense of being many-enterprises-within-one-department. A sense of being many-enterprises-within-one-department is much better for maintaining departmental harmony (and my department has really been astonishingly good for a very long time at maintaining departmental harmony) than a sense of being many-enterprises-within-two-confederations-within-one-department. Which is certainly not itself an argument against making changes that will better suit students focused on qualitative research, but it does suggest that we should be careful in how we do it. If you look at sociology as a whole, it doesn't take a rocket scientist to see that the jillion or so research enterprises going on under the banner of sociology can be divided with only modest mess into two distinct confederations that have commensurability-gaps along several different dimensions--not just methods. Indeed, maybe not even primarily methods: at the level of forces-shaping-the-discipline-at-large, I wonder if the confederations may be less well defined in terms of the two Qs as Better-Able-to-Attract-Students and Better-Able-to-Attract-Grants, although maybe that's just the closet material determinist in me speaking. It's quite a trick, then, to pull off a department that is broadly representative of the discipline as a whole and still manages to get along well with itself. One specific idea that people have had is for there to be a general qualitative methods course as the first course in the sequence followed by some specialized course of the student's choosing. For that idea to go somewhere there would have to enough faculty who are willing to step forward to teach the general qualitative methods course so that it can be taught frequently enough to meet demand. I suspect that could end up being a nontrivial obstacle for the proposal. A whole different problem is that "qualitative methods" is really something that gains its coherence as a concept by virtue of its not being "quantitative methods," and so the content of a general qualitative methods course itself could be an object of contention. When I started teaching 750, I tried looking in methods textbooks for a positive definition of qualitative methods and came up empty-handed; all of the places I looked defined qualitative methods basically as non-quantitative research. The big difference in sociology, I think, would be better research based on naturalistic-observation-and-interviews and reearch based on reading-(historical?)-texts-and-if-its-about-something-where-the-people-are-still-alive-then-also-interviews. I don't know if that difference would itself cause a schism in trying to think of a general qualitative methods course or if it would be quickly settled. Nose, bleeding, right now. Again. Fourth day in a row. Just like every time when winter begins. I could go to a doctor and get the cauterization thing done, which I contemplate doing every year, but, as opposed to all the things I contemplate doing and do not do out of a congenital lack of follow-through, this one is for a reason: I worry that once I start on the cauterization path, I'll be doing it every year, and then by the time I'm 50 I will have no sense of smell left. Some time ago, at a Superbowl Party, there was a Mountain Dew commercial that was so hideously stupid that Erin and I vowed, immediately, that neither of us would ever, ever again drink Mountain Dew again (or, any of its spinoff products, such as Diet Mountain Dew, Caffeine-Free Mountain Dew, or, later, Mountain Dew: Code Red and Mountain Dew: Special Victims Unit). Last night, however, I was involved in a complicated dinner take-out mix-up that involved someone else walking away with my beverage and me walking away with theirs, and their beverage, I discovered after a fateful swallow, turned out to be Mountain Dew. What to do? I feel like I've breached the wall of moral turpitude, and now the rest of my life is going to be a slow tornado-slide ride down into deeper and deeper circles of hell. I saw Studs Terkel last weekend, twice. He made me laugh the first time, and would have made me laugh the second had they not been the same jokes as the first time. Most people over 90 can't even make me laugh once, so he deserves credit for that alone. For the record, I have not read anything in sociology recently that, if it were taken seriously by the public, would specifically kill Studs Terkel, which is not to say that he might not be an incidental casualty. The same as last week. This past week has not been a good week diet-wise. It hasn't been a bad week, either, and I remain resolute in my avoidance of non-diet soda and Michael's Frozen Custard. So, consistent with my ongoing efforts to Be More Positive, I note that things could be worse. As far as the mythical journey from Seattle (beginning weight) to Key West (end weight), I am presently stranded in Bozeman, MT, but hope to resume truckin' soon. The Onion this week has a story titled Mom Finds Out About Blog. I appear to be safe from this for now. Not only has my mother not figured out Google yet, but she has actually been temporarily thrust off the Internet superhighway due to a an annoying problem with the automatic billpaying I have been using to pay her ISP bill. Recently, I had to once again invoke my personal vow that while I am willing to go-along-to-get-along with a lot of things in sociology that I don't think are well done, I draw the line when the work, if taken seriously, would kill people. I know this might sound like a silly alarmist vow, since most of sociology is not taken seriously outside of sociology (or, for that matter, with large parts of sociology itself). However, it seems like if one is going to have a career as a sociologist, one should be able to feel with some authentic sincerity that it's a bad thing that sociology isn't taken more seriously. And, if you are typically opposed to people needlessly dying, as I am, then you can't very well feel like sociology should be taken more seriously and also take a pass on work that makes unsubstantiated conclusions that, were they taken completely to heart by all who have a say in social policy, would almost certainly result in all sorts of deaths. Note: work is not exempt from this clause if the author does not recognize that their work, if followed through to its conclusion, has these potentially fatal implications, nor it is exempt if the author is oblivious but has splendid political intentions. I recognize that this may seem harsh and overly judgmental, but it's a vow and I'm sticking to it. I realize that both this vow and this resolution would be better expressed if I provided some examples, but I have no plans on beating up on my disciplinary brethren in this weblog. I cause enough problems for myself. *note: affinities between this and the idea that people should support a Presidential candidate based not on what they think of the candidate, but what they imagine other people would think of the candidate, are mostly specious affinities and could be commented upon at much more length if I hadn't already spent too much time typing out this post anyway. what's that streaming out of my nose? why, it's a bellwether. Yes, today arrived the most certain of the signs that we are on the cusp of winter here in Madison: my first nosebleed of the season. Get out the humidifiers! The other night while I was sitting in the Orpheum watching a show, I suddenly had this thought--as far as I could tell, completely apropos of nothing--"Boy, remember The Amazing Adventures of Kavalier and Clay? That was sure a good novel." I had read it almost exactly a year ago. So then, the next day, I grabbed it off my bookshelf in the RV and started reading it. And, indeed, it is really a spectacular novel. It has the kind of prose that doesn't bowl you over but every so often you think, wow, this is really good prose. It's also remarkably consistently good prose. I can be really micropicky about writing and hold grudges against authors for one subordinate clause that I didn't like. I'm about three-fourths of the way through, and I don't know if I've hit anything that I've regarded as a clunky misstep. (Okay, now that I think about it, there is this scene involving an explosion at a bar mitvah where I don't think he handles the 'action sequence' part of it very well.) But the real kicker is that it combines such great prose with this really meticulous and clever plot. It's in the genre of intendedly artistic novels that can be read as drawing their coherence from taking a single evocative phrase/theme/idea (in this case, "escape") and then crafting a plot that allows for its exploration from every conceivable angle. Anyway, I have to get to work now, but you should read it. do you worry about people who maybe don't want their private emails to you posted on your blog, where any fool who has known you for, say, [double digit number] years can identify the author? or is there a selection thing going on, where anyone who may have once been inclined to send you something private now avoids it? or maybe it's not an issue to most of your readers--i'd be curious to see a standard error of the mean # of message authors your readers could identify. on other fronts, [name A] & i agreed that it was [name B]'s responsibility to get the scoop on why you went to taiwan, but being at work 24 hrs/day is getting in [pronoun's] way, so i'll just ask for all of us: what kinds of talks were these? why taiwan?? Of course, we can start with this message, and so This Week's Special Weblog Contest is to identify the author, [name A], and [name B]. E-mail me with your entries. My reply to the part about my weblog: I generally ask people before I post their messages to my weblog. The major exception would be messages that are about my weblog, which I post with crazed abandon. Some names I suppress with the idea that some people who know them will know who they are, but others won't. I also suppress and abbreviate names sometimes so that the weblog post won't come up when the person is Googled. I'm still surprised by the number of people who have run across the weblog at one time or another. My reply to the part about Taiwan: Awhile back, I exchanged e-mails with a professor in Taiwan who asked me a question about sociobiology and altruism (he was interested in what it might have to say about the outpouring of helping in response to a natural disaster there.) The professor continued to be interested in the topic, and later was in a position to bring in a couple people from abroad to talk about the implications of developments in biology for social science. He's in sociology, and so there's not a large pool to draw on in that regard anyway. Anyway, he e-mailed to ask me if I would come give two days of introductory talks on genetics, and I said I couldn't really talk about that but could talk about evolutionary psychology and sociology. So that's what I did. A professor from North Carolina did three mornings on behavioral genetics, and I did two afternoons on evolutionary psychology. And then I spent three days on the back end of the trip sightseeing. Everything you have heard about the Taiwanese being extraordinary hosts is true. Wonderful, wonderful, generous people. And Taiwan is absolutely gorgeous. I know we haven't talked in a long time, and I feel bad about that. current on what's going on in your life, just isn't the same. yes, anything [name omitted] writes or says goes on the blog. it to the blog, but no such luck. I think I need to add two disclaimers to my weblog: first, about how the reading the weblog is not intended as a substitute for first-hand interaction and, second, about how the posting or non-posting of e-mails on the weblog should not be taken as implying some particular sentiment about either the e-mail or its sender. I am having JFW's crackerjack fleet of attorneys work on drafting these now. I realize that the last entry left off with me complaining of chest pain and then nothing else. Anyway, I did go to a doctor yesterday and it turns out to be nothing more than some kind of muscle pull, which is what I suspected. time in viet nam, and had this incredible pain in the left side of my chest. ran out & people stopped asking. and a few months later the pain went away. i still have the scar on my elbow from the accident. On my way to the doctor's office last night, incidentally, I stopped at Subway for a diet-consistent VeggieMax sandwich. It was the eeriest thing... when I walked in, it looked like a Subway that had just opened for the very first time and I was its very first customer. Everything was completely stocked and clean, and the produce trays were not only all full but the produce looked so fresh that I actually stuck my head around the sneeze guard to see that it wasn't some trick of the lighting. Maybe they are coloring their vegetables now, I don't know, or using some kind of extra-special-genetically-modified vegetables. I thought for a moment that perhaps the chest pain was worse than I had thought and that I had died and gone to the newest franchise of Subway in heaven. I have this enormous pain just to the right of the center of my chest. I woke up with it yesterday morning. It feels like I pulled some kind of sternal muscle. Shelly B think I may have broken a rib and should go to a doctor immediately. Instead, I've spent the day holed up in the RV doing these endless analyses for this pair of talks that I'm giving tomorrow. If I have pulled a muscle or broken a rib, I did it while I was sleeping. I've had a cough, and I've heard of people messing themselves up while in the midst of a phlegm-hacking-fit. Anyway, enough complaining. be there. i love the uniforms (can you believe that?) and the stadium. The thing is, his wife really does really hate birds. 'hey teacher' goes on mandatory tour, coming to a choral hall near you! Same friend, class, and student as all the past "hey teacher" episodes on this weblog. Once this instant messenger way of talking becomes so commonplace as to be institutionalized in dictionaries, the whole world of Scrabble will be shaken to its foundations. you already had the cookies, you FINALLY found the milk,...GOT JESUS??? Last week: z - 5.6 pounds. This week: z - 6.4 pounds. In other words, I'm down 0.8 pounds for the week. Not stellar progress, but progress nonetheless. In terms of our hypothetical journey from Seattle, WA to Key West, FL, this puts me just past Bozeman, Montana. wouldn't you like to be a bright, too? Update to the post below: A self-proclaimed Bright from Madison, WI has sent me the URL for a location where you can buy your very own I'm A Bright T-Shirt. A bright is defined as a person whose worldview is naturalistic (free of supernatural and mystical elements). There are lots and lots and lots of persons who have such a worldview. They are different in many ways, but they share a common outlook on the world, one free of supernaturalism. Of course, not all these brights know they are brights, since this terminology has only recently been introduced. In many societies in the world, potential brights maintain a low profile regarding their worldview. All too many of them just don't mention their outlook to others, and and hence the worldview of brights is insufficiently expressed within a given culture. The Brights Movement is an endeavor to unite brights under the umbrella of a common name.... The primary focus of the Brights Movement is the marginalized situation of brights in the political and cultural landscape of society. Today's brights are all too invisible. They are ignored by most and their philosophical perspectives are disparaged by many. Unlike their fellow citizens whose worldviews are more culturally accepted, all too many brights are reluctant to engage themselves fully and openly in civic concerns and the business of the nation. NEED TO TALK WITH YOU ON SOME THINGS!!! It would seem that any discussion on the variation of performance of baseball teams with respect to football teams must include some discussion of pitching rotations. A star pitcher for a baseball team can strongly bend the odds towards a win, but that pitcher can only play in one out of four games. Football doesn't have anything comparable. Certainly so. I dodged that issue. It's intriguing to think about how baseball would be different if it were like softball and pitchers could pitch every day without much cumulative wear on their arm. (Or, alternatively, if baseball games were only once a week.) What do you think would happen? My first-pass guess would be that the variation between teams would increase considerably, carrying with it more predictability in the outcomes of individual games. Baseball would also become a lot more like basketball in terms of the identifiability of teams with single players who are considered responsible for carrying much of the teams overall players. The star(ting) pitcher of each team would probably account for 40-50% of the teams' payrolls if no restrictions were placed on the outcome. No one broke any windows until people at the inn incited the crowd, Verveer stressed, adding that a group singing the Minnesota Gophers fight song from a window invited trouble. My recreational-occupational reading this past week has been on intelligence testing. Far more could be said about the issue than anything I would ever bother to write up for the weblog. But, anyway, one issue that's been gnawing at me is the suspicion that statements to the effect that "50% of IQ is genetic" is often read as implying that IQ variation is much more constrained than it actually is. This led me to do some math to figure out what actually is implied by the statement. Imagine that IQ is "real," that it is normally distributed, that we have some way of measuring it exactly, and that we can also exactly measure the contribution of genes to IQ. We can focus on people who have genes that are exactly average for the part of IQ that is genetic, and we can ask what kind of range the middle 95% of IQs these people with exactly-average-genes would have relative to the entire population. We can do this by looking at the expected "typical variation"--that is, how well an "overachiever" does who is at the very top end of this middle 95% compared to an "underachiever" with the same genes who is at the bottom end of this middle 95%. If IQ was 100% genetically determined, then the concept of "over" and "underachiever" wouldn't even have any meaning, because everybody with exactly-average genes would have exactly-average-IQs, meaning that our overachiever and underachiever would both score in the 50.0th percentile. 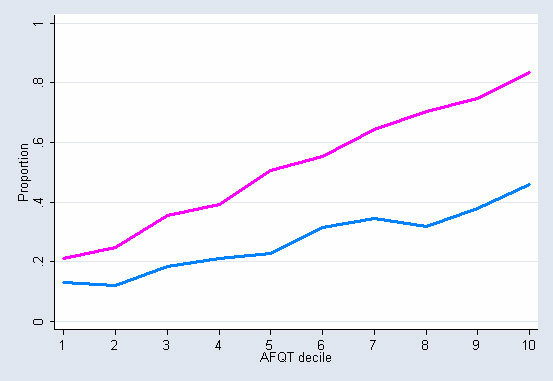 On the other hand, if IQ was 0% genetically determined, then the distribution of IQ among people with exactly-average-genes would be the same as the distribution of the population as a whole, meaning that our overachiever would score in the 97.5th percentile and our underachiever would score in the 2.5% percentile. So, if IQ was not-at-all genetic, there would be 95 percentage points of difference between our over- and underachiever with exactly-average-genes that we would need to explain by nongenetic factors, while if it was all genetic there would be 0 points of difference left to explain. The question is what the difference between the over- and under-achiever would be if IQ was 50% genetic, given what is statistically meant when people say "50% genetic." The answer, after a drumroll, is that the overachiever would score around the 91.3rd percentile, and the underachiever would score around the 8.7th percentile. So where there were 95 percentage points of variation difference under the not-at-all genetic scenario, there are still more than 72 percentage points out there to be understood in the fifty-percent-genetic scenario. Saying that a trait is 25% genetic may seem like a lot, but for this same logic the overachiever-with-exactly-average-genes would score in the 95.5th percentile for the overall population and the underachiever would score in the 4.5th percentile--91 percentage points of difference compared to the 95 points if the trait was not-at-all genetic. Even when a trait is 75% genetic, which is about as high a claim about heritability as one sees, there would still be a difference of more than 66 percentage points between our overachiever (who would score in the 83.3rd percentile overall) and our underachiever (who would score in the 16.6th percentile overall). A statistical analysis I would like to see would compare the distribution of NFL won-loss records at the end of the season in recent years with the distribution of MLB baseball records after 16 games. Basically, what I'm wondering is whether NFL's movement toward parity has led it to become as seemingly stochastic in the outcomes of individual events as baseball is. So that the frequency of, say, 13-3 or 3-13 teams in the NFL is no more common than it is in baseball, and so that the only reason that there are more teams that win 70% of their NFL games vs. 70% of their baseball games is that baseball plays 10 times as many games. A flaw with this kind of analysis would be that baseball teams play the first sixteen games of their season against about five opponents, whereas football teams play their sixteen games against, what, thirteen opponents? (ten? how many teams do football teams play twice? [update: a reader from Ithaca, NY tells me that it's thirteen opponents, with three played twice]). That should make baseball appear less stochastic through 16 games than it would be if the first 16 games were played against as diverse a group of teams as the NFL does. Who cares? Why is this interesting? It's intriguing to me because there is a whole ethic in baseball built around the idea that you can't make too strong of judgments based on one game and so you need a 162-game regular season and best of 7 series in the postseason, while in football there is a whole ethic built much more around the idea that merit shows itself in Big Games, so that it's hard to even imagine someone proposing a best-of-3 Superbowl. Sports analysts certainly seem to feel much more confident about their predictions for a Super Bowl than for Game 1 of a World Series. So, it's something to imagine that the underlying randomness in the outcome may be ultimately about the same. I suppose one could make a similar judgment by comparing what the largest spreads of odds are for a game in football versus a game in baseball. 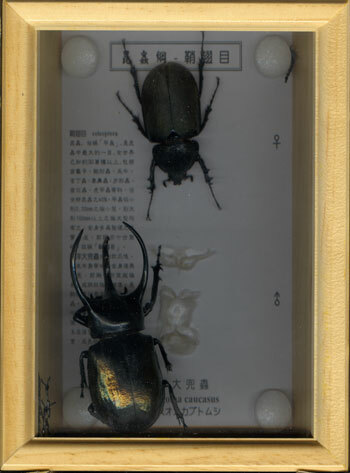 I just discovered that the most expensive souvenir I bought in Taiwan, these giant mounted beetles that cost me close to $60, did not survive the plane trip. Instead, one of the beetles came unstuck and several of its legs are broken off inside the frame.